Marie thinks zombies are ridiculous. So what would she make of the granddaddy of all zombie flicks, Night of the Living Dead? I’ve long been of the opinion that zombies are ridiculous. They move so slowly that you should be able to run away from them quite easily. Particularly if, like me, you have a low centre of gravity. Drop the shoulder, turn on a sixpence – they don’t stand a chance. One bop to the bonce should be enough to see them off … and yet they seem to create havoc. Zombies are ridiculous. Even with my limited knowledge of horror film, I know that George A Romero was the granddaddy of the zombie movie, so where else to go for my fix than Night of the Living Dead. Released in 1968 and made on a relatively tiny budget, Night of the Living Dead sees a group of people trapped in a house, surrounded by recently revived corpses, with only the radio and television updates for information. The lighting and distorted camera angles only add to the feeling of unease. My one quibble is the music. Not the score itself, but the fact that it seemed to be constant. Perhaps that was the convention at the time, but after half an hour it got on my nerves a little and I could have done with a short break. The person who emerges as leader of the entrapped group is Ben (Duane Jones). He directs the decision making, is the lead in the physical activities of boarding up the access points, he keeps a clear head when everyone else is in shock or panic. He tries to get everyone to work together as being the best way to overcome the threat – but some of the others are unsure. There are clear racial themes emerging, particularly when Ben is nearly locked out by Harry Cooper (Karl Hardman), and Ben makes it clear that he knows exactly what Cooper was up to. I was surprised by just how much violence was suggested and portrayed. Ben is brutal in the way he repeatedly beats the ‘ghouls’ in the head to stop them, and the cannibalism is definitely unnerving. Of course, the danger isn’t only from outside the house – there is danger within too, as (obviously) one of the party is infected already and so the group succumbs on two fronts. I think one of the most disturbing elements, over and above the head beating, is the image of the young girl chomping away on her father’s flesh. I’d like to think that Romero deliberately chose to cast Duane Jones in the lead role to have him exercise control over, and be the decision maker for, the remaining (white) characters, thereby making a specific point about racism and the state of the nation in the year in which both Robert Kennedy and Martin Luther King were assassinated. The way the television news reports are shown, with a group of middle-aged gun-toting white guys standing around describing their strategy for attack was scarily reminiscent of footage we’ve seen of white supremacist vigilante groups preparing to set out for an evening’s sport. The fate that befalls Ben (Duane Jones) at the end certainly plays in to this – and is sadly only too topical, with the innocent black man being shot in the head without question by a white man, who is then praised for his actions. I still think zombies are ridiculous however, and I have no urge to watch any more of them. But whatever messages you take from Night of the Living Dead (racism, anti-nuclear, a nation divided), I can totally see why this is such a classic. I can’t imagine any others in the genre living up to this one. It’s my favourite so far! 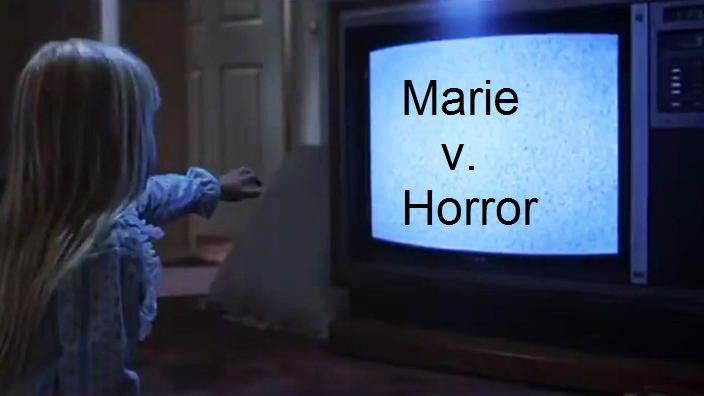 Marie will be back later this month for her penultimate Marie Vs. Horror column for the season. It’s a doozy!! !